SQLite is a C library that implements an SQL database engine. It is a Relational Database Management System (or RDBMS). Most of the SQL databases work with the client/server model. Take MySQL for an example. To enter and receive data from a MySQL database you need to send a request to the MySQL server, which on reception will provide you with the appropriate response. Contrary to MySQL, SQLite databases are operated directly from the disk. There is no need to create requests to the server. We will operate on our database using the sqlite31 Command Line Interface(CLI). We will work under the Linux Platform. sqlite3 CLI for MAC OS and Windows are just the same, but for the sake of consistency, it’s recommended you install Homestead Improved – a lightweight VM runnable in 5 minutes that will keep your computer clean of extra unneeded software. The second line tells you to enter .help for instructions. 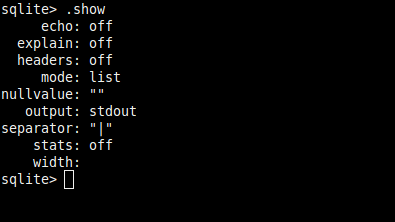 There is a prompt waiting for you to type a command. So go ahead and enter .help. This will give you a list of Meta Commands and their descriptions. Data Definition Language: It provides the storage structure and methods to access data from the database system. Data Manipulation Language: It enables users to manipulate (add/modify/delete) data. Data Query Language: It enables users to retrieve required data from the database. Note: SQLite understands many other standard commands, a list of which can be read here. Since the tutorial is a beginner level introduction, we will cover only the above mentioned commands. SQLite databases are cross-platform portable files. They can be stored on various storage devices and can be transferred across different computers. Of the four of these, only website URL is optional. We must also define a column that numbers the comments. Let’s call it post_id. You can see the documentation for different Datatypes and Storage Classes provided in SQLite3. SQLite3 uses Manifest Typing2. Most other database engines including MySQL use Static Typing. This will create a database file comment_section.db in the current working directory. Note: If no filename follows the command, sqlite3 automatically creates a temporary database. It is what happened when we entered the single command sqlite3 for the first time. NOT NULL makes sure that the particular value is not left empty in a record. PRIMARY KEY3 and AUTOINCREMENT4 elaborate the post_id attribute. To check if table has been created, issue the meta command .tables. It will display the table name comments. Now that the table has been created, we need to enter data. Comment : Great tutorial for beginners. To insert it, we use the INSERT command. I have not provided the value for post_id, even though it is defined as NOT NULL. The thing is, it is not needed because it is an AUTOINCREMENT field. Enter some more rows in the table to practice. We have learned to insert data into the table. To retrieve data we use the SELECT command. This will retrieve all rows from the table. The resultant table might look obfuscated without headers and proper separation between columns. To overcome this, we must alter some parameters. To display column attributes, enter .headers ON. To display rows in column style, enter .mode column. Enter the SELECT statement again. Note: Select a mode of display that suits you. Enter .help and search for .mode. You will be shown the various values .mode can have. This will change the email attribute for the name ‘Shivam Mamgain’ to ‘zyx@email.com’. Note: The name attribute is not unique, so the above statement may affect more than one row. For every name = ‘Shivam Mamgain’ the email will be set to ‘zyx@email.com’. To update a particular row use the post_id attribute. It is defined as a PRIMARY KEY and will always be unique. To DELETE row(s) from the table we can use the WHERE condition, just like in UPDATE. This will create a column username in comments and will set its datatype to TEXT. The value of username for already inserted rows will be set to NULL. The ALTER command is also used to rename tables. Let us change the comments table to Coms. SQLite3 offers many advantages over other relational databases. Some of its distinctive features can be read here. Most PHP Frameworks and many other web frameworks including Django, Ruby on Rails and web2py have SQLite3 as their default database. Being lightweight makes it preferable for local storage in web browsers. It is also employed as client storage for many Operating Systems, including Android and Windows Phone 8. It is one of the most widely deployed database engines. In the tutorial we interacted with an SQLite database system. There are GUI applications to do the same, without having to learn commands. Two such applications are the DB Browser for SQLite and SQLiteStudio. You can also practice SQL online at SQL Fiddle. This guide has covered the basics to get you started with SQLite3. I hope it will tempt you to go further. You can easily integrate it with PHP using the common PDO class.